Is there a certain food that you know you couldn’t live without? I think everyone has theirs. As for me, well…it’s cheese. That’s right. Any kind of cheese. And don’t go thinking for a second that just because this dip is made with Irish cheese, you can only have it around March 17th. Because that’s just not true. Consider this a year-round dip…even if cheese isn’t your “would die without” food. Preheat oven to 300 degrees. Combine all ingredients in a bowl and mix. Spoon into a 9 inch pie plate and spread evenly. Bake for around 30 minutes. Serve with crackers. 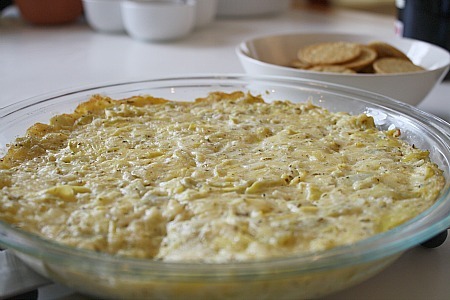 This entry was posted in appetizers, artichokes, cheese, dip, garlic, QuickAndEasy. Bookmark the permalink. I had this as a sample at Whole Foods last week. It was one of the best things I’ve ever tasted.